No-one was hurt in the act, police say. Police have detained the Georgian ex-president, former head of the Odesa regional state administration and leader of the Ukrainian Movement of New Forces, Mikheil Saakashvili, in Kyiv, his ally David Sakvarelidze said on Facebook late on 8 December. Prosecutor-General Yuriy Lutsenko confirmed Saakashvili's detention. "According to the warrant, employees of the National Police tracked down Saakaashvili to Vidradna Street in Kyiv and detained him. He was placed in a remand centre. Investigative actions and a request to a court to select a measure of pre-trial detention are planned," he said on Facebook. The National Police said no-one was hurt during Saakashvili's detention in Kyiv's Solomyanskyy district. Police did not enter the tent camp outside parliament. 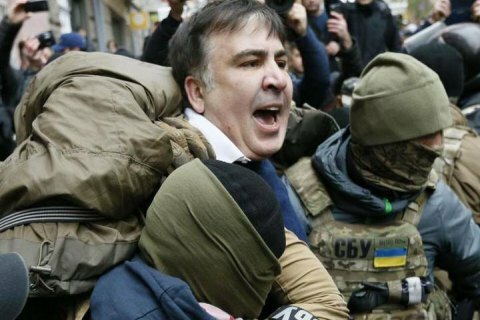 On 5 December, law enforcers attempted to detain Saakashvili but he was released by the crowd. He is suspected of working with fugitive oligarch Serhiy Kurchenko, currently based in Moscow. The latter allegedly gave him 500,000 dollars on antigovernment protests.